Wednesday, Sept. 19 and Thursday, Sept. 20 at Delaware, Ohio, resulted in a parade of public choices. That, as our readers know, is not the kind of atmosphere where we thrive. On Sept. 19, Jugette day, the first or second choices in 17 races won 65 percent of the time. 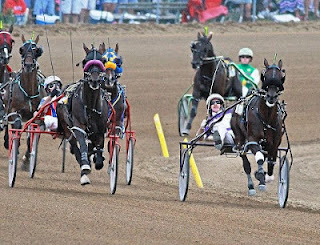 That was just an overture to Little Brown Jug day, when there were 20 races, with 85 percent going to the top two choices. On “Jug” day we scored only in The Ms Versatility Final, where Frenchfrysnvinegar won and paid $7.60 (one of the second choices) and our old pal Pantholops finished second at 45-1. That was a perfecta worth $192.20. Of the two outsiders we suggested to present the best value in the Milton Final on Sept. 22 at Mohawk, Rocklamation came through, paying $48.50. The New York Sires Stakes finals at Yonkers on Sept. 22 produced three races where we suggested plays. Two of three won. Coraggioso took the soph-colt trot mile and paid $11. Major Bombay, who we backed unsuccessfully in the Jug only a few days ago, caught our eye in this mile and he won it, paying $18. Frosh-pacing-superstar Captaintreacherous got a taste of The Red Mile on Sept. 20 in a morning qualifier. The colt is in preparation for Grand Circuit stakes engagements in Lexington, Kentucky. Tim Tetrick sent the Tony Alagna-trained-Captaintreacherous to the lead from post 4 and rated the colt through fractions of :29.4, :58.2 and 1:27, sending him home in :26 for a 1:53 mile. Stablemate Emeritus Maximus and Sir Richard Z Tam were 3 lengths behind. Captaintreacherous is aiming to wipe out another field, this time in the Bluegrass Series on Sept. 29 and the International Stallion Stakes on Oct. 6. After a second in his career debut on July 20 at the Meadowlands, the Somebeachsomewhere colt won five races, including three in sub-1:50. He has banked $741,337 at two so far, well on target to make it a million-dollar season and hope to come back sound at three. After being away from the races for almost a year, $1.6-million winner Define The World returned to his home track of Kawartha Downs to qualify in 2:00.2. 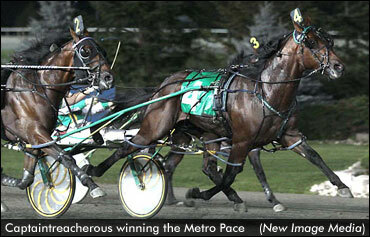 The seven-year-old trotter has recovered from knee surgery. He was Canada’s representative to the Oslo Grand Prix in Norway and the Elitlopp in Sweden in 2010 and 2011; he was off since November of last year. John Bax trains him. Pompano Park opened its 48th season of live harness racing on Sept. 19. Racing has a 7:05 p.m. post time. The south Florida oval’s racing schedule includes 140 programs from mid-September through the end of June. Programs will be conducted on Wednesday and Saturday nights for the first three weeks with Mondays being added beginning Oct. 8. From Nov. 20 through April 6 Pompano will race four nights a week (except Christmas Eve, Christmas and New Year’s Day) with the addition of Tuesday evenings. The balance of April and the month of May will revert to a three-nights-a-week schedule with the season ending in June with programs two nights each week. The Breeders Crown is the next target for all the top horses in their divisions. Click here to get to the exclusive Breeders Crown Countdown blog. Check out special podcasts available for beginners and veterans of harness betting, a new series available free so you can learn more to bet more and win more at TwinSpires. Click here.